Do books give you a hangover? I mean you read a book and then you dream of the characters in the book. It happens to me and when it happens I can safely say that the book in question has made a mark in my heart. 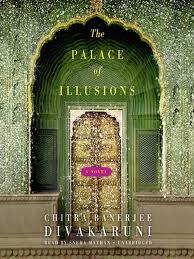 The Palace Of Illusions was one such book that I read in just four days flat. Well, bookworms may scorn at me for being vain for nothing but since I have known my recent history of reading books, for me it's a BIG and GOOD feeling. I liked the book for the breezy narration and a different outlook it has given to the entire Mahabharata epic. The story unfolds in parts as dreams, stories and musings of Draupadi-the narrator of the story. The writer-Chitra Banerjee Divakaruni- has woven fiction and truth into an engaging novel. The women in this great Epic are brought out in a stronger light and we get to see a modern-age Draupadi baring her heart and soul through her narration. Thanks for the book recommendation Uma! I'm a big fan of Mahabharata/Ramayana related stories and usually read any adaptation I come across - and this one sounds very interesting for sure :). I've heard good things abt this book. I was very hesitant to read because her earlier one - mistress of spices - i did not like AT ALL. But this one sounds good. Have u also read Shashi tharoor's "the great indian novel" - very engaging. Aparna - you may like this becos it is based on mahabharata. Aparna: then you'll def like this book...although be prepared for a few imaginative variations though woven very well. Aparna: Oh! and I was all about to buy Mistress of spices..
Haven't read Shashi Tharoor's novel..will keep in mind for my next buy/rent. I am hearing so many great things abt this book, definitely on my to-read list! And I have seen the movie verson of "Mistress of spices" starring Aishwarya Rai B. It was sort of ok, dunno if its the same thingas the book though. Let us know about the Shashi Tharoor one if you read that. Totally agree with the book hangover theory! Hell!..I am still hungover from Herman Hesse's Siddhartha ! !after all these years ....Thanks for the suggestion....Palace of Illusions will definitely be my next book. Simran: Yeah, even I was prompted by good reviews over the blogosphere and I wasn't disappointed. Will let you know if I get hold of the other book. Tan: Then you'll like this..
Arv: kya be..itna hangover? I did read that book..hmm..
"And reading a book in 4 days with a lil one around is no mean feat :-)"
I read this by chance and wasnt too impressed...I should say I had mixed reviews in my head...So I went and borrowed her other books from the library...sister of my heart rocked...borrowed vine of desire and it was a hasty decision...regretted the read...Loved the conch bearer...was disappointed with mistress of spices...the unknown errors of our life was okay...and after that I decided to stop and give a break reading Divakuruni :) Maybe I should read some more positive reviews of her other books and pick some more from the library!